In my opinion, this stir-fried beans recipe is one of my best test recipes that I’ve ever cooked. I hate eating beans because they give me goosebumps whenever I take a bite of crunchy, half-cooked beans. Para kasing kumakain ako ng plastic whenever I take a bite, nagtataasan ang mga balahibo ko. When my wife asked me to cook a beans dish similar to what she had tasted before, I gave it a try and was amazed with the result. 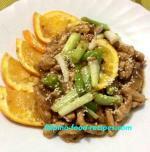 It's so easy to cook and costs less than a hundred pesos for a 4–5 person serving. 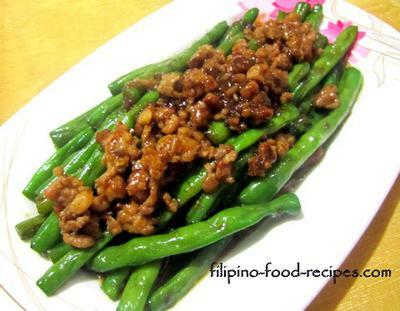 It is also very delicious, with a sweet and rich sauce paired with the crunchy cooked beans. I asked my son to try it, he loves trying something new every time. Just like a judge critiquing a dish in a cooking contest, he gave me a two thumbs up saying “ GRABE, sarap pala nyan Daddy" with a happy and satisfied face, that he devoured 3 plates of rice effortlessly at dinner time. So now, I promise you that this dish will give you and your loved ones a “face of satisfaction” once they try it. Simple but bursting with flavor! 1. Clean the green beans by removing the edges and sides, then wash.
2. Blanch the beans by dropping in a pan of boiling water for 2-3 minutes, then straining and soaking in ice water (to stop the cooking process). 3. In a pan, saute onion and garlic in butter, and add ground pork and cook until the meat is lightly browned. 4. Add oyster sauce and cooked for a minute. 5. Mix in the green beans and about 1/4 cup water and bring to a boil for 1 - 2 minutes. 6. Lastly, add the Knorr liquid seasoning. 7. Using a pair of tongs, plate the beans first and then pour the meat sauce on top.